The Chetco river is known as one the best fall Chinook, and winter steelhead fishing destinations in Oregon. Flowing approximately 55 miles from its headwaters in the Siskiyou National Forest the Chetco river winds its way to the Pacific Ocean. 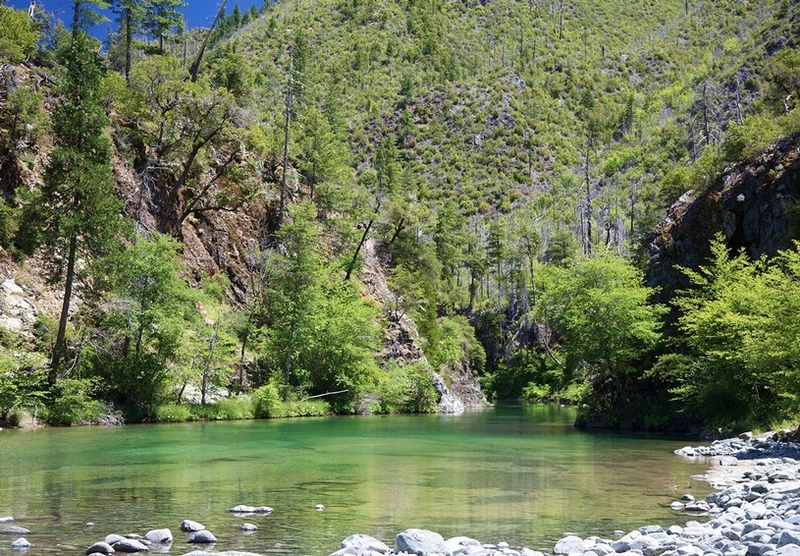 The Chetco is also one of Oregon’s longest undammed rivers allowing for the free movement of the Checto’s prized species of salmon and steelhead. It is one of Oregon’s top-producing rivers in terms of trophy salmon and steelhead and angler catch rates. Each year a number of salmon in the 50-pound range are caught, as well as several steelhead over 20 pounds. From mid-December through March, the Chetco plays host to one of the best winter steelhead fisheries on the West Coast. Biologists say the Chetco has one of the highest spawning densities of wild steelhead in Oregon. It’s run of wild steelhead is healthy enough that it’s one of the few rivers in the world where anglers can keep wild fish. The river also has a robust run of hatchery steelhead. During the peak season, from the last week of December through February, multiple fish days are common. Steelhead average from 6 to 12 pounds on the Chetco, but fish to 20 pounds are caught every season. The Chetco River record steelhead is 28 pounds, bigger than the Smith River and California state record. One of the best sections of the Chetco to fish during steelhead season is from the confluence of the mainstem and South Fork to Loeb Park. Most of the stretch is located within the Siskiyou National Forest. The upper river also often fishes when the lower river below Ice Box is blown out after heavy rain. Beginning in late September big king salmon begin to stack up off the mouth of the Chetco. These are some of the biggest salmon in Oregon, with fish averaging in the mid-20-pound range, and plenty of 30-, 40- and even 50-pounders caught each fall. The biggest salmon caught in the Chetco, a 65-pounder, was taken in November 2011. Early in the season, anglers catch big salmon near the mouth of the Chetco. The ocean bubble season, and the estuary season, often produces multiple fish over 50 pounds. Trolling plug-cut herring is one of the most effective techniques for catching big kings in the Chetco tidewater and ocean waters just off the mouth. On the Upper Chetco from November through mid-December, anglers fish for these trophy salmon with fairly light gear. Fishing opportunities are pretty much year round for salmon and steelhead. Season runs Jan through March and May through December. This fishery generally allows 2 salmon or 2 steelhead per day. See regs for restrictions on wild salmon and steelhead retention. **See Oregon State fishing REGS for details. Standard gear, certain areas barbless hooks required, fly only and bobber rules as well. See regs for details! Hand to Hand. Eye protection recommended! in the hot spots but you can always find a place away from the crowds.